I saw the cutest thing for a little girls room. Update: Found the Blog(s). Two of them. Yeah! Thank you so much Shannon for sharing the links with me. I am so glad I can now tell everyone where I found this idea. Yeah. Shannon @ One Crafty Mommy is where I saw this beautiful project. Make sure you check out hers too! And she got her inspiration from Tiffany @ Making the World Cuter. So go see the original. It is a must. She has a BOYS one and a Family Rules One. Cool! So for mine, I added a few more lines because my board was too big and I wanted a few personal touches. First I cut scrapbook paper into strips. (12" x 2") Tore the edges to give it a different look. Then glued them with mod podge. Then after letting the glue dry completely. (at least 2 hrs.) I started adding my text and embellishments. I was going to use different colors but was happy with the colors of the scrap book paper. I wanted it to pop, so using just the black paint pens made it look just how I wanted. I used E-6000 to glue on a Picture Hanger (on the back) and it was ready to hang. My princess at her party! 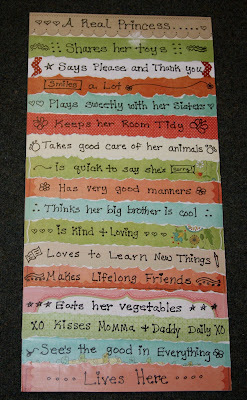 This would also make a wonderful gift for any lil girl. I am making one for lil boys too. I will have to post that soon too! and thanks again "mystery blogger" for you great inspiration and borrowed words! Made by Tara at "Ayers Family Happenings"
Don't you just love her name. LOL I love her take on this project. So, cute! That is so precious. And she is adorable. Love it! My 4 y.o is just getting into Princess stuff and this is a great idea. Thanks for the follow on Twitter! Wow, you did a fantastic job. I love the colors you chose. A step away in the right direction from the pinks and purples! That's really cute. I'll have to make it this weekend! But I don't know if that's where you found it. Looks really cute though! But if you have any fun suggestions for sayings, I would love it. 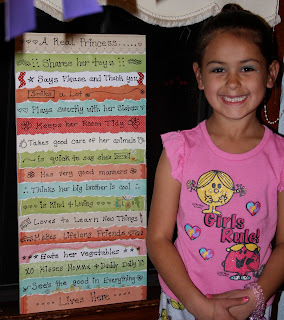 Karisa, Thanks for the link for the Family Rules. I remember seeing that one, but it wasn't the exact one. Darn, thought someone might have found it. I will have to keep looking. Thanks again. And thanks again to all for the sweet comments. That's the only place I have seen it so I hope that is where you find it! Such a cute & creative idea! I'm definitely making this my next project for my 3yo princess!